Before the Gun Target alarm clock, man was powerless to retaliate against morning oppression in any way besides hitting the snooze button a little harder than usual. This dynamic need no longer exist: channel your pent-up aggression against your alarm clock by silencing it daily with target practice. 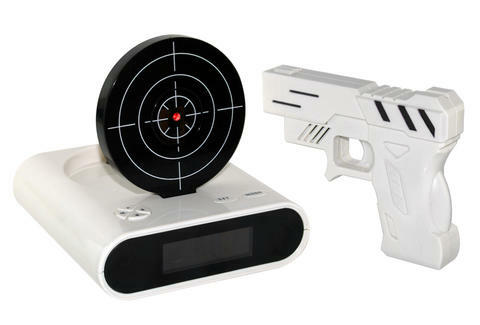 To shut the clock up, use the gun provided to hit a laser target. You have the option of using the prerecorded alarm or recording your own annoying message for a truly satisfying wake-up call. The clock comes loaded with two games so you can practice before actually showing down. It's not right to have to start every morning by losing the battle against your alarm clock... now each day will begin victoriously.